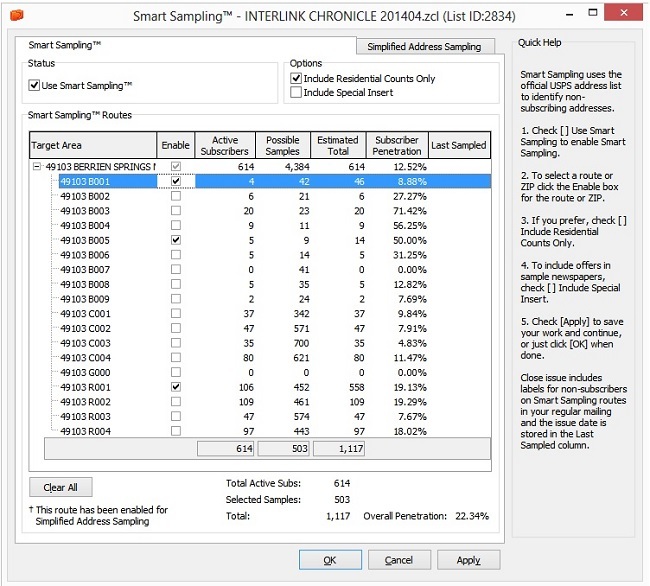 When updating your Circulation software to version 2.3.16, you’ll notice a few changes to your Smart Sampling screen, with the most significant transformation being two separate tabs labeled Smart Sampling and Simplified Address Sampling. Smart Sampling allows non-subscribers to be targeted along individual routes with no disruption in labeling and delivery quality to current subscribers. Smart Sampling, which is used with purchased USPS-certified addresses, allows you to insert special offers and promotions only in non-subscribers papers. Your sampling efforts will be more focused and effective. For occasional total market coverage, Simplified Address Sampling is the tab to select. Simplified addressing allows you to blanket your area without differentiating your subscribers from non-subscribers. We encourage you to take a few minutes and give the new sampling tabs in Circulation a test run, and call us with any questions you have about sampling. We’re excited to launch these new Smart Sampling features to streamline your sampling process to make it more focused and to help grow your circulation. To learn more about what’s new with Circulation Version 2.3.16, or if you need help updating your software, click here for release notes and installation instructions.